This is a guest article by Molly Manwill. I was road tripping through Melbourne last month when I heard the “Great Forest National Park” (GFNP) mentioned on a local discussion station. Intrigued, but busily meandering through Melbourne traffic, I looked up the GFNP later that evening with the idea of visiting. I was surprised to see that it is simply a proposed park. Many national parks around the world were set up long ago, recognising the conservation and economic importance of natural areas. So as a conservationist and tourist in Victoria, it’s extremely interesting to see history in the making, the ongoing discussion from both sides, and also to develop my own view, purely from a tourist’s perspective, on this park. The GFNP proposal stands to add 353,000 hectares of new protected forest to the 170,000 hectares already existing in the area. There are big arguments for the instatement of the new park, including conservation of the mountain ash ecosystem and especially conservation of flagship species such as the Leadbeater’s possum. Conservation also goes hand in hand with the tourism potential of the park, with visitors coming in and spending money to see species like the extremely cute possums. Much of Melbourne’s drinking water catchment forms in the proposed park’s coverage and the proposals would protect this vital water supply, which is already under pressure. Health and spiritual benefits associated with nature are another important bonus to the increased park protection. Carbon storage is another reason to protect these areas, with programs even available to pay for this ecosystem service. Carbon storage has benefits beyond Victoria and even Australia – the violence of Hurricane Harvey, which hit Houston in August this year, has been attributed to climate change and there are pressing needs for global climate stabilisation and carbon sequestration. However, with the designation of the proposed park, jobs associated with the logging of these areas would be lost. Coming from a farming background myself, I understand how daunting and scary this would be for families who rely on logging in these areas. A large company that commercially logs and sells hardwoods in the area is not only contesting the park, but also requires an increase in the amount of logging permitted to maintain expansion and to prevent the loss of around 280 local jobs. There are arguments for and against the park that understandably impassion local residents who share a stake in the decision. Being a tourist and therefore having no stake in it, I can’t really comment on the topic further – but I can comment on an important perspective, considering that one of the biggest arguments for the park is the potential income from tourism. Data from the Blue Mountains National Park Authority released for the year 2016-2017 suggested that the biggest majority of international visits to the Blue Mountains were from British tourists, aged 15-29. The most popular activities were visiting coffee shops and restaurants, visiting parks, bushwalking and rainforest walks. I fit into this demographic, and dutifully I journeyed to the Blue Mountains when I visited Sydney in 2015. If I hadn't travelled through Melbourne with an Australian friend, I may not have visited the city with four seasons, but I would certainly have wanted to visit the national park with the tallest flowering plants in the world – the mountain ash – and with cute Australian wildlife like the Leadbeater’s possum. The popular demographic currently visiting the Blue Mountains is the Instagram generation in the era of “collect memories, not things”. That is, tourists visiting to trek and post their trendy mid-hike coffee on Instagram. Creating a vibrant, trending eco-park would be a huge draw to tourists wanting to get that “back to nature” selfie. This may also be a wonderful time to add an element of rewilding to a newly formed park. It would be a fantastic opportunity to reintroduce species that will naturally “engineer” these landscapes for better ecosystem health. Researchers and scientific staff could then be employed to monitor these projects, adding data and findings to this highly regarded aspect of ecology. Lessons from Yellowstone show that natural reintroductions often have far-reaching positive impacts. Conservation has historically been about conserving species from extinction and this is as important as ever; however, rewilding brings fantastic opportunities to conserve many species at once, sustainably and long term. The GFNP is an exciting opportunity for Australian wildlife populations and human populations. I think the proposal for this park presents wonderful opportunities: for new, modern tourist villages to evolve in the park, with lost logging jobs turning into roles as park rangers and hotel owners, creating a range of sustainable, innovative jobs and not only bringing tourists to the park, but to Melbourne. Sydney has a network of easily reachable parks close to the city, and Melbourne has the scope to emulate this, but in a modern and innovative way. The proposals already in place, such as ziplines, skywalks and new campsites – to name only a few – suggest that this park will be the exciting, cool park for younger generations, but with the infrastructure set up for “grey nomads” as well. The GFNP could be an escape for tourists and city-weary Victorians alike wanting to see Australia’s wildlife the way it should be. Molly Manwill is a conservationist with a passion for rewilding and sustainable development, and how these can work together. She loves making conservation issues accessible and involving community as much as possible. Banner image courtesy of Molly Manwill. Less than two hours’ drive from the centre of Melbourne, the towering skyscrapers of the city are replaced by giants of a different kind: the Mountain Ash. These remarkable trees are the tallest flowering plants in the world and the forests they populate are home to Victoria’s only endemic mammal, the critically endangered Leadbeater’s Possum. Despite making up some of the most spectacular landscapes Victoria has to offer, montane ash forests are currently facing threats on two fronts: fire and logging. The authors of Mountain Ash, professors and researchers at the Australian National University, know the montane ash forests of the Central Highlands of Victoria intimately. ANU research has been conducted in the region for more than 30 years; it is the longest-running environmental study in the world. The authors’ aim to distil decades of research within a 150-page book could have resulted in a dense account of their findings, but this is not the case. Instead, the authors have created a vivid and accessible narrative describing the challenges facing Victoria’s giant forests. This publication utilises images in abundance to create a visual reference for the reader; the accompanying captions provide just as much insight as the body of the text. These images allow the reader to see for themselves the patterns of fire across the forest, the differences between old growth and post-logging regrowth, and between areas of forest burned at varying severity. These images are an invaluable tool to understanding the text, but at all times the authors communicate their subject clearly and with enthusiasm. Beginning with an overview of the Black Saturday fires and the flora of the forest, the book goes on to examine the responses to fire of possums, gliders, birds, invertebrates and small terrestrial mammals, as well as the impacts upon large old trees and carbon stocks. Finally, recommendations are made for the forest’s future management. In succinct descriptions broken up by ‘myth-busting boxes’, diagrams and many photos, the book spells out clearly the extent of the destruction that has already occurred in our forests and how further damage can be avoided. Uniquely placed by their ongoing research to examine the same areas of forest in detail both before and after the Black Saturday fires, the authors are able to offer a comprehensive view of the destruction caused by fire. Intriguingly, they have discovered that the cycle of logging in montane ash forests actually enables further damage by fire, in turn degrading the habitat of the Leadbeater’s Possum, for which large old hollow-bearing trees are vital habitat. Mountain Ash is essential reading for all Victorians. It alerts the reader to the degradation of the crucial habitat of our faunal emblem, the Leadbeater’s Possum, and an iconic tree species, the Mountain Ash. The closing chapters indicate that change is possible as well as necessary to ensure that our forests are protected; reading this book is only the first step towards joining the cause. This book belongs on your bookshelf if… you’ve ever felt enchanted by the forest. A currently contentious and highly publicised topic, Victoria’s Leadbeater’s Possum (Gymnobelideus leadbeateri) has been our state’s faunal emblem since 1971 and is an ancient, arboreal species of marsupial that is thought to be around 20 million years old. The species was named after one of Melbourne Museum’s chief taxidermists, John Leadbeater, although it also goes by the common name of the Fairy Possum. Newly listed as a critically endangered species and known for its habitation of old-growth forests, this possum has been continuously spoken of in both political and ecological circles for the past few years. This is primarily due to the species’ significance in regards to logging debates and the potential development of the Great Forest National Park in Victoria, as well as its now critical population status. The following are some vital facts regarding this species for those interested in learning more about the unfortunate plight of our unique faunal emblem. The soft coat of the Leadbeater’s Possum is grey on the upper body, and cream on the underside and cheeks. Below each cheek is a dark brown stripe of fur, whilst another similarly coloured stripe extends along the upper body from the head to the tail. Their tail is narrow at the base, but extends into a broader shape towards the tip, growing up to 165mm in length. Their body as a whole has been measured at up to 170mm, and generally weighs between 100 and 165 grams. The species also possesses large, rounded ears of a thin texture. The diet of this small possum ranges from tree sap to various invertebrates. Favoured saps and gums, also known as exudates, include wattle and eucalypt manna as well as honeydew, whilst consumed arthropods vary from crickets, beetles and moths to ants and spiders. Note the distinctive dark brown stripe along the upper body. Image courtesy of D. Harley. As a fast and agile climber, the Leadbeater’s Possum spends a lot of its time climbing and foraging for tree sap and insects in its arboreal habitat. Surviving up to five years in the wild and up to 13.5 years in captivity, this possum species lives in matriarchal (female-dominated) colonies of up to 12 individuals, with only one pair in each colony breeding each season. Other members of the colony typically include one or more generations of offspring, and some unrelated males. Due to their communal living habits, these possums build nests of shredded bark to accommodate the colony in the hollows of generally larger, older trees. They are known to fiercely defend their territory surrounding the nest (1.5 to 3 hectares) from other groups of their species. As they occupy some of the tallest forests in Australia and are nocturnal, individuals are rarely sighted in the wild. Breeding can take place up to twice a year in the Spring and Summer period, and then the Autumn and Winter period. Each litter consists of up to two joeys, and females are able to breed again within the same season if the first litter is unsuccessful. 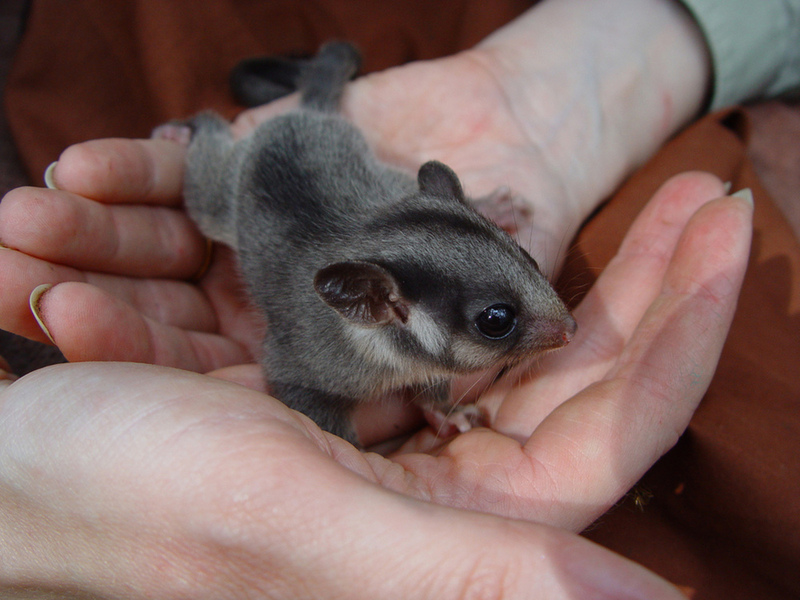 As marsupials, Leadbeater’s Possum joeys remain in the mother’s pouch for approximately 12 to 13 weeks and are then weaned when they are about four months old. When female offspring reach an age of 10 to 12 months, they must disperse to other territories following their eviction from the colony. This species is distributed across the Central Highland forests of Victoria, whilst a more isolated population is located closer to Melbourne in Yellingbo. Various factors may influence a colony’s choice of habitat, such as the number of old, hollow-bearing trees for nesting, density of wattle trees and various shrubs in the forest understorey, and the connectivity of the area that may or may not allow individuals to move throughout their territory. The forests they reside in typically contain a significant amount of Mountain Ash (Eucalyptus regnans) trees, whilst the presence of various species of Acacia shrubs may also be an important factor in habitat choice based on the possum’s dietary preferences. Regrowth following fire has also been found to be an extremely significant factor in regards to range and habitat. As of April 2015, the Leadbeater’s Possum has been classified as critically endangered. This classification means that this species is now viewed as being under our nation’s highest level of protection in regards to environment law. Various threats could be to blame for the 80% decline of the species since the 1980s, including the devastating effects of Victoria’s 2009 bushfires on the hollow-bearing trees that the species call home, as well as the logging that takes place before and after fires that may otherwise have left some habitat remaining for the possums. However, this is not the first time that the Leadbeater’s Possum has been under serious threat. In 1921, the species was declared extinct, as no individuals had been sighted since 1909. It was not until 1961 that an individual possum was found and captured in forests close to the rural area of Cambarville, Victoria. In the same year, a colony was found not far from Marysville and, since then, searches have yielded sightings that suggest the existing population is focused around the Victorian Central Highlands. A captive breeding program has since been developed at Healesville Sanctuary and is currently made up of six possums originally from the Yellingbo population – a genetically distinct population to that found in the Highlands. It is thought that there are now under 1000 individuals left in the Central Highlands area following the devastating 2009 bushfires and around 40 inhabiting the Yellingbo State Nature Conservation Reserve. The Leadbeater's Possum is a beautiful and unique example of Victoria's faunal history. This new conservation status means that now more than ever do we as a state need to ensure the survival of this species, even in the face of natural disasters and habitat destruction. Hopefully, the high amount of publicity this critically endangered critter is receiving may ensure its protection into the future - although only time and the efforts of those involved will tell.